It is officially August 1st and that means my annual MommyMaestra Back-to-School Fiesta begins! I'm over the moon to finally - FINALLY! - announce the launch of my book, The Latino Family's Guide to Homeschooling!! I didn't realize it at the time, of course, but this book has been 8 years in the making. I began writing it when I started this blog. But I didn't realize that I had the content for a book until early this year with the entrance of our country's new administration. Suddenly, I began receiving emails from parents who were scared to send their kids to school and wanted to know how they could start homeschooling. It's all here on MommyMaestra. But I know that it can be hard to navigate through 8 year's worth of content. And if you are like me, you like a physical book that is laid out in an orderly fashion that you can just pick up and reference, write notes in, and take with you. Really, homeschooling has been around forever. Currently, however, it is considered the fastest-growing form of education in the United States. It is estimated that there are currently more than 2 million children being homeschooled in the United States. And it is quickly growing in popularity among minority families. In fact, according to this article, Hispanics now comprise 15% of the homeschooling population and that number is expected to double. At any rate, it was reading about how recent ICE raids and an increase in bullying were scaring Latino parents into keeping their children out of school that finally prompted me to put together this guide. And for the last 6 months, I've been compiling and editing and asking permission and pleading with other Latino homeschoolers to share their own stories. Then there was the issue of formatting and the cover and...ay-yay-yay! You get the picture. Plus I chose to self-publish because I felt it was the fastest way to get this book into your hands. It's like giving birth to a baby...at home. By yourself. Ha! 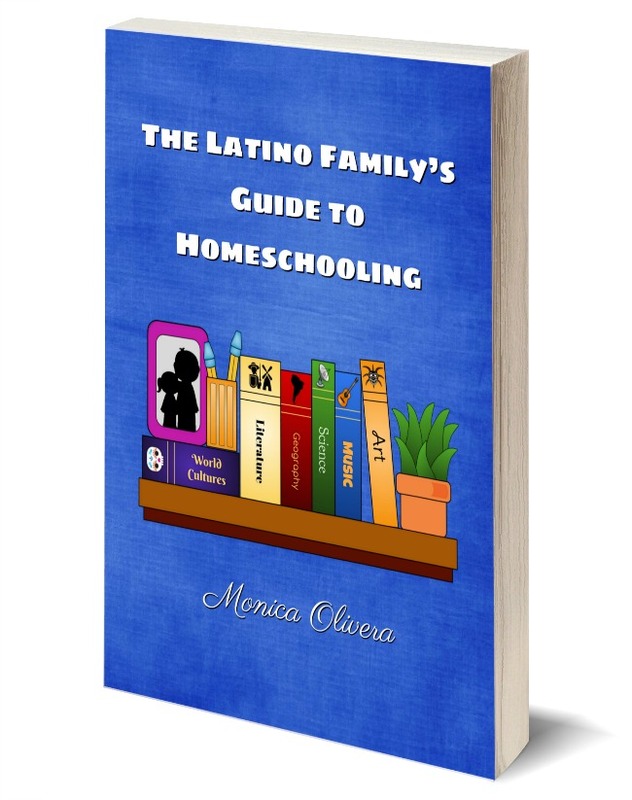 And I'm so happy to announce that The Latino Family's Guide to Homeschooling (aff) is now available! Whatever your reason for considering homeschooling (i.e., wanting to nurture your child's bilingualism at home, unhappy with the level of educational opportunities in your area, a mobile/travel lifestyle, fear for their safety...), this book was designed to help you get started and provides resources for those of you who are already on the journey. In these pages, you’ll read about the homeschool experiences of families that represent the diversity of the Latino culture. A veteran Cuban-American mom homeschooled her four children long before homeschooling was considered commonplace, and despite negative reactions from family and friends. A Spanish-American mom decided her autistic child wasn’t getting the support and education he needed from his public school, so she took the chance to homeschool him and couldn’t be happier. And a Chilean-American mom shares five tips that may help you arrive at your final decision as you consider this option for your family. These and many other homeschooling mamis share their stories to encourage other families who may be considering educating their children at home. Monica! I already started sharing. This is so exciting. Thank you! I'm considering homeschooling a 1st grader and preschooler! My oldest starts PreK but I'm considering to start homeschooling when she starts Kinder :) I also have a 9 month old , I'd like start with her sooner . Thanks for the opportunity! Awesome! I will request copies be purchased by our library system! I am so excited about this book and I love your blog! Thank you for sharing your journey with us! Very cool! Interested on your take about bilingual homeschooling. Hope I win!! Gracias!!! Wow. I believe that this guide will be the perfect for children to make them able to cover all their homeschooling tasks. Thanks for sharing its giveaway. Thank you!! What a wonderful resource and guide for bilingual homeschoolers. Monica, thank you for making available such important resource, specially in times as these. This is great will be ordering one in my next book batch purchase! I have 4 children that I'm going to be homeschooling this fall. They are 14 (grade 9), 12 (grade 7), 8 (grade 3) and 5 (kindergarten). Exactly what I have been searching for. mother of four and beginning my journey in homeschooling with two of my kids kindergarten and first. looking forward to reading your new book.